Delabole is a fascinating village which has grown up around a slate quarry that has been worked since the thirteenth century. Yet, until 2007 no history of the quarry and the village had ever been written. This book, based on a Ph.D. thesis, remedies that omission. The quarry at Delabole and the village that has grown up around it preserve a rich legacy in the context of Cornwall’s industrial history. This book explores many of the aspects which go to make up that history – the working environment in the quarry, the lives of the men (and women) who laboured there over many centuries and the development of the settlement around its industrial heartland. The book also examines the way in which the village community has been moulded by the landscape in which it is set, religion (particularly Methodism), links with Wales and emigration. 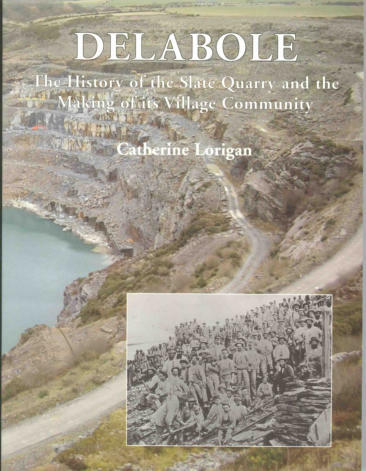 “ The author seems to have left no stone unturned in her exhaustive search of the history of Delabole, its quarry and anecdotes about it, all carefully referenced…Thoroughly recommended.” St Teath village website. 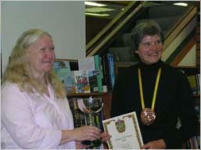 The Holyer an Gof Awards 2008 Catherine Lorigan receives the trophy and certificate from the Grand Bard.